Is Your Business at Risk from Drones and Wifi Imaging Threats? In a little noticed development last week, the Pentagon announced new guidelines allowing military installations to take down drones that fly near or over military sites. While rules of engagement as well as the actual countermeasures in use remain classified, the military’s announcement is intended to assist base commanders to explain guidelines to their local communities. What is clear is that, in the words of Pentagon spokesman US Navy Captain Jeff Davis, “the increase of commercial and private drones in the United States has raised our concerns with regards to safety and security of our installations.” If the organizations that effectively pioneered the use of drones are now concerned about drone espionage within our domestic borders, what does that mean for the rest of us, who are significantly less well-prepared to deal with drones and for whom active countermeasures are a legal morass? In truth, drone espionage is the latest security nightmare for all government installations, commercial buildings trying to maintain data security, and even homeowners. As we pointed out in our July 10 blog on drones, the FAA has estimated that 2.5 million drones were purchased in the United States in 2016 and 770,000 drones had been registered in the 15 months leading up to March 2017. Basically, all the technological threats from standard photo and video surveillance, Wifi hacking, IR surveillance, and TEMPEST may be mounted on drones and thus even harder to detect and faster to exfiltrate, as explained in this report from NBC Chicago. On a more personal level, a group of men on a luxury yacht off the coast of Majorca caused a major kerfuffle in June when they used a drone to spy on a group of naked local women sunbathing on a neighboring boat. Finally, as mentioned in the last blog, Wifi Imaging Threats are new and truly amazing methods of mapping the inside of a building with nothing more than two drones rigged with Wifi – see this incredible video. Window treatments: Perhaps you only need to protect against video or photo surveillance, in which case Signals Defense has customized blind and shade solutions to fit every window imaginable. 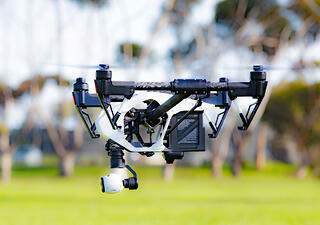 Think carefully about the new threat from drones. They are as bad as every other threat to your data security, but more mobile. Again, if the Pentagon is taking them seriously, shouldn’t we?